The Miami-Dade Police Department has released surveillance video showing the suspects of an armed robbery in which the victim was shot in the face. NBC 6's Steve Litz reports. The Miami-Dade Police Department has released surveillance video showing the suspects of an armed robbery in which the victim was shot in the face. The victim – 53-year-old Miami resident Juan Mendoza – was shot on Jan. 6 shortly after 9 a.m. in the area of Northwest 30th Avenue and NW 76th Street. As Mendoza walked to his vehicle that morning, he reached for a wallet that was on the ground. He was approached by three armed suspects – one of whom carried an assault rifle, according to police. The suspects attacked him, entered their vehicle and fled the scene. Mendoza then entered his own and followed the suspects for several blocks. 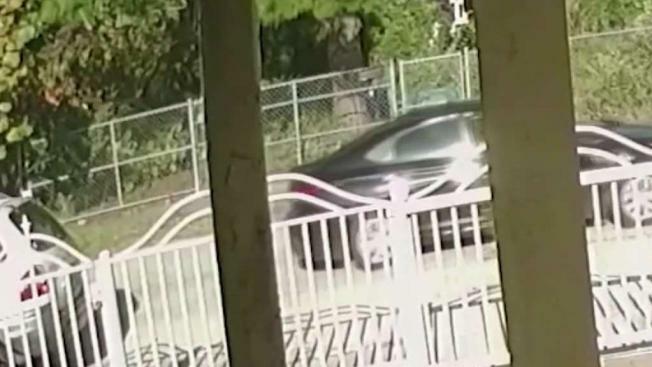 "The subjects' vehicle suddenly stopped in a residential neighborhood, at which time the armed subject exited the vehicle and shot at the victim, striking him in the head," MDPD said in a statement. The victim was transported in stable condition to Jackson Memorial Hospital's Ryder Trauma Center. Police said the suspects were traveling in a newer-model, dark-colored Hyundai Accent sedan. Anyone with information is urged to contact Miami-Dade Crime Stoppers at 305-471-8477.